One of the first things you will see when you open any video editing program is of course the user interface. When trying to decide which editing software you want to choose there is an importance to this point but there is also a need to put it in its correct perspective. All computer software attempts to some degree, to mimic the same function that the software is replacing in the real world. For example when you open a Word document it looks like a blank sheet of paper ready to be written on. When you open a database file it actually copies the form of an old card file system. The difficulty in designing user interfaces for consumer video editing software is that the average consumer has no terms of reference upon which to base the design. It can’t imitate something that you as a consumer are familiar with. If it weren’t for digital editing software you wouldn’t be performing this action in the first place! At the “prosumer” or professional level of editing software this is a less difficult task because these types of software tend to imitate the original concept of film editing. Quite literally, they copy the action of someone physically cutting and splicing together pieces of celluloid film. For pro editors this is an easy concept to understand and work with. For the amateur it makes no sense at all. As it stands today most consumer editing software tries to follow the logical sequence of steps that the average person would most likely take in executing a project. Generally they will have an interface that begins with capturing or somehow importing your video, audio and still image assets into the program. This should include some reasonably controllable library set up to keep track of everything. The next step would be cutting, trimming and combining those video files on the timeline with the addition of any video effects or filters as you work. The last part of the process that we could describe as “editing” would involve audio additions and edits following through to titles and subtitles if needed. The final step of the process is the rendering or creation of the completed project in the video file format you require. This could be an MPEG2 for DVD or an MPEG4 uploaded to YouTube or similar. It is this general sequence that the designers are using to create the interfaces you see. Whilst this design layout does make sense when you look at it from a process point of view it does lead to confusions in other areas. 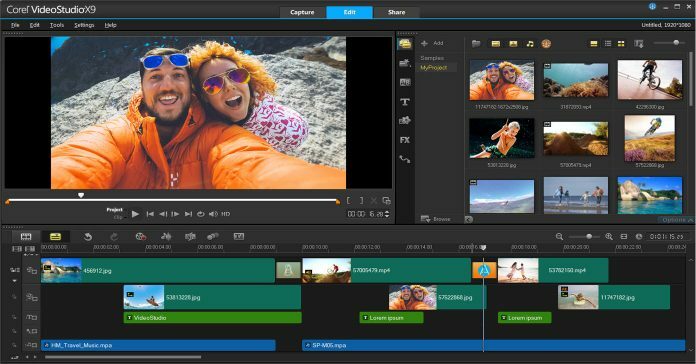 The main cause of these confusions is that anyone who is new to video editing software will be expecting the software to behave similarly to other software programs. One of the major points upon which this occurs is the simple action of “saving.” If you have a Word document open and make changes and then “save” what happens? Of course the changes are saved and the document is now updated to reflect those changes. If you do the same thing in any video editing software… nothing happens! The reason for this is that one of the major rules for video editing software is that the original files are never changed. They are never touched in any way so as to… well… to be honest, to protect you from yourself! It doesn’t matter what you do when using consumer video editing software the originals are always left intact. So that gives the designers a dilemma. The user wants to save his or her changes but they can’t touch the originals in case there is a mistake. The solution to this problem is what they call project files. A project file is a tiny file that the software writes as you are editing. It keeps a record of what you want to change. What video to use, where the original is, when to start the audio, what filter to apply where… everything. When you hit the “Save” button in your video editing software it is this file that is being saved. It is not your entire project that is being saved. It is only when you have entirely finished your project that you come to the point of actually creating the final product. Until then all the changes you have made have been “virtual” and exist only as entries on the project files. For the designers we hit the second problem. They can’t use the command “Save” because that is for the project file. There are many different commands used depending on the software you look at. Some call it “Sharing,” some call it Creating” and others call it by any other number of names. If you have no experience at all then ALL the software you look at will have confusing aspects to them. No matter which one you choose there will be a process of having to learn the interface before you can use it effectively. If you are changing from one video editor to another the same applies. You will have little habits and routines that will not apply to the new software and you will keep looking to the wrong spot on the screen for things. In this case it is not so much a learning process but a retraining process. Simply make sure that as you look around the software interface you can see at least the mains functions that you will be going through in the video making process. I noted recently a number of scathing reviews of consumer or amateur video editing software programs. What amazed me was that these were of very successful and quite effective editing programs. After carefully reading them I realized that the person reviewing the software was either a pro editor or at least was talking from the point of view of a pro editor. From that perspective of course all amateur video editing software is going to appear clunky, non-intuitive and illogical. The only software solutions that would satisfy what they believe to be important are the top of the line $2000 to $5000 fully professional suites. Not very real to the rest of us mere mortals! Keep these points in mind and good luck with your choice.